In every in-transit concrete mixer that arrives at the construction site one must always check that the dispatch note corresponds to the given order. Special attention must be paid to the ex-act time of the mixer’s charging so as to ensure that between the completion of the casting and the charging, the elapsed time is lesser than two hours. It is suggested to also check the printed order form to verify the above timelines. In case it is required to inspect the amount of concrete inside the mixing drum, one must always bear in mind that the concrete’s unit weight usually ranges between 2360 and 2400 kg/m³. This means that a 10m³ mixing drum has a net weight varying from 23.6 to 24.0t. • For an amount of concrete less than 20 m³, 3 test samples must be taken from different mixing drums. This means either 3 samples from the same mixing drum or 3 samples from each drum, in cases that 2 mixing drums are needed for the concreting process. 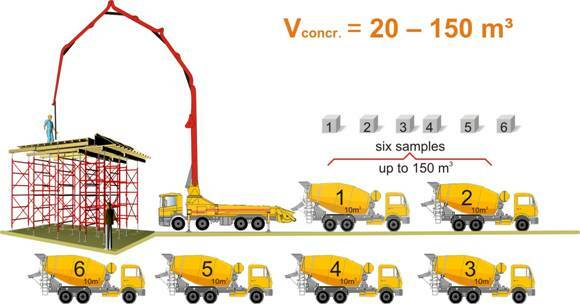 • For an amount of concrete ranging from 20 m³ to 150 m³, 6 test samples must be taken from 6 different drum mixers. 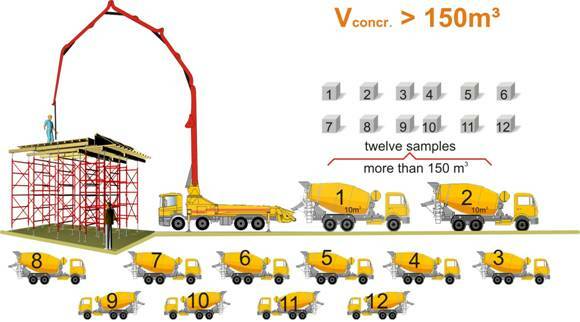 • For an amount of concrete greater than 150m³, 12 samples must be taken from 12 dif-ferent drum mixers. Samples must be taken from different in-transit concrete mixers and must be transferred to a certified laboratory for special curing within 20 to 32 hours.